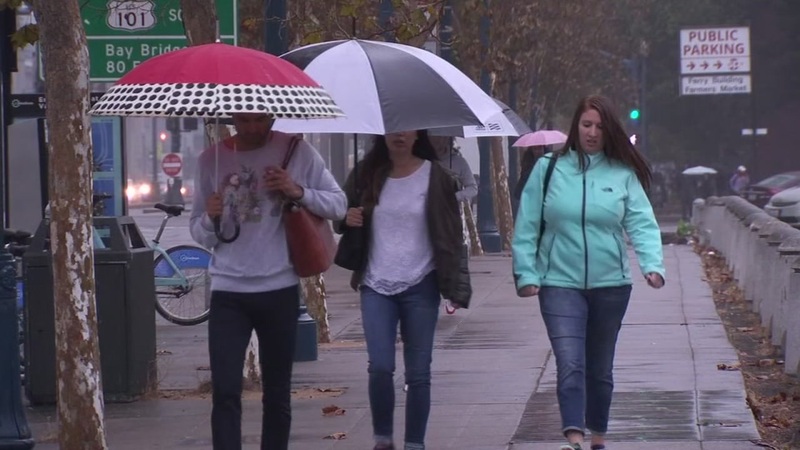 SAN FRANCISCO -- National Weather Service forecasters are expecting moderate rainfall and strong winds to arrive today in the Bay Area, with a half-inch to 1.25 inches of rain expected in most urban areas tonight into early Friday. Rainfall totals are expected to be higher in the North Bay. Higher elevations could see 3 to 4 inches, and some peaks could see as much as 5 inches of rain. Strong winds, downed trees and power lines are also expected. Weather conditions could snarl this evening's commute, and possibly again Friday morning, according to the weather service. The storm will also bring heavy seas this weekend, with 17-foot waves and 45 mph winds expected, prompting the U.S. Coast Guard to urge mariners to boat with caution or avoid the water altogether. The weather is expected to get hazardous today and stay that way into next week. A small-craft advisory has been issued, meaning that winds from 23 to 37 mph are expected to produce hazardous conditions, especially for smaller vessels. Boaters are advised to check weather and current information before heading out and stay informed using television, radio and Internet. They're also asked by the Coast Guard to file a float plan with family or friends to assist rescue crews in case of emergency, as well as to wear a life jacket and bring marine flares, bilge pumps and a working marine-band radio.